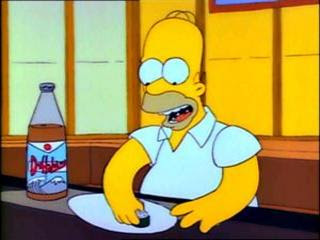 The Setup: Desperate for a change in their dinner routine, Lisa convinces the family to try the new sushi restaurant, which Homer loves so much he eats everything on the menu, including accidentally-poisonous blow fish. A Work in Progress: Akira, the sushi chef voiced by George Takei, appears for the first time. 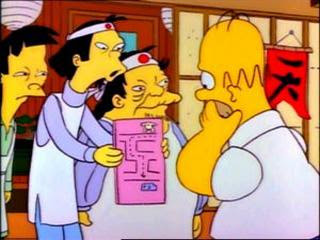 He'll pop up now and then (notably as Bart's karate teacher in "When Flanders Failed") but is more or less a background character. This is the first time the "Homer says no, Bart and/or Lisa says "please Dad" over and over until he gives in" bit is used. 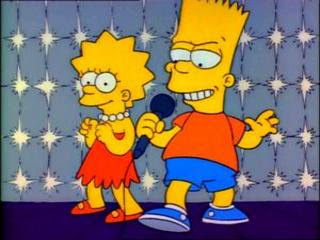 Fun Fact: When the Fox censors balked at Bart and Lisa singing the theme from "Shaft" in the sushi restaurant's karaoke bar, believing the lyrics weren't appropriate for TV, the writing staff dug up footage of Isaac Hayes performing the song during a telecast of the Oscars. Dr. Hibbert: The second is anger. Homer: I want to share something with you: the three little sentences that will get you through life. #2: Oh, good idea, Boss! #3: It was like that when I got here. Homer: Goodbye, Maggie. Stay as sweet as you are. Goodbye, Lisa. I know you'll make me proud. Goodbye, Bart. ... I like your sheets. Teebore's Take: An episode that masterfully walks the fine line between humor and emotion. It's not too sappy, yet at the same time Homer's reaction to his apparent mortality is effective and moving (the way items on his "to do before I die" list keep getting circumvented is a great example). This is another episode that must not get rerun very often, as it never got properly recorded and added to my videotape collection back in the day. Also, in my senior year of high school a friend and I wrote a speech which used Homer's three lines of advice to Bart in this episode as a framework for tackling post-high school life. We submitted it for consideration as the speech to be read at graduation, but lost to a speech that used eagles as a metaphor for post-high school life (our school mascot was an eagle...). 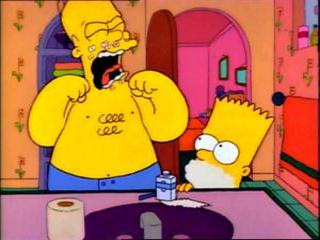 Finally, the scene in which Homer teaches Bart how to shave also taught me how to shave. Crank Call: Is Seymour there? Last name Butz? A fine example of "The Simpsons" ability to strike the right balance between satire and sentiment. Wow! I have never seen this episode! I watch Simpsons reruns almost everyday! Oh, I have over half the seasons on DVD and have seen the episodes umpteen times, and I still watch at least a few minutes of an episode every day, if not more. For whatever reason, it seems like this one doesn't get rerun very often. I know the older stuff gets overlooked in syndication, but even then, there's a handful of eps that rarely get replayed. My memory of this episode as a kid was wondering why they exclusively referred to the Bible as "The Good Book" and feeling like there was some joke there I was missing. Also, I learned to shave from The Cosby Show. "Theo, you don't need to use a whole can"
HA! Is that right? Am I making this up? I know Bill told Theo what to do in about 2 sentences so I decided shaving must not be that complicated.